Color(s): Blue, brown, yellow, red, brindle, or black with tan or brindle points. There may be a small amount of white markings. Often referred to as the "pioneer dogs of the Southern mountains", this versatile breed is steeped in tradition. Mountain Cur's are highly respected for their ability as hunter, protector, guardian, and farm worker. 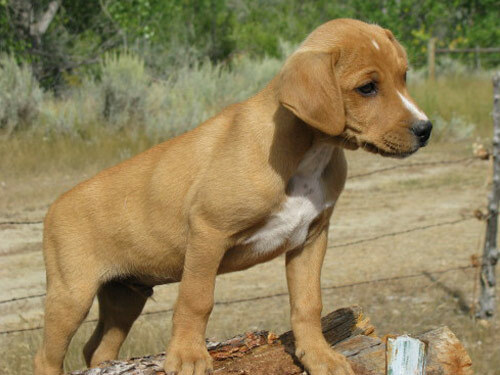 The Mountain Cur is muscular, rugged, and stocky. They are exceedingly fearless and squarely-built. They possess expressive eyes, great stamina, and are very agile. The Mountain Cur breed is an excellent hunting companion of small to large game. Their rough nature does not make them suitable for homes with children. They do not do well with dogs they do not know and are not recommended for homes with non-canine pets. The Mountain Cur is wary and suspicious of strangers and will not hesitate to protect their family and property. Occasional brushing is recommended to remove loose and dead hair. Bathing should only be done when absolutely necessary. Due to their skin being easily irritated only a mild shampoo should be used. There are no known genetic health issues associated with the Mountain Cur breed. The Mountain Cur is a double coat breed. The outer coat is short and may be rough or smooth in texture. The under coat is fine, soft, and dense.